At Apex Scaffolding, we have over 25 years experience of erecting scaffolding throughout Lancashire, Cumbria and the wider North West. Persimmon Homes - Scaffolding for approx 110 new build plots on brownfield sites at Fleetwood and Preston, Lancashire. Associated British Ports - Shipyard scaffolding for the refurbishment of vessels in dry dock and various works on port and quayside maintanence. Conlon Construction - New build of innovative steel structure in Blackpool. Scaffolding for warehouse refurbishment in Leyland, Preston. Galliford Try - Construction of new accommodation at Preston barracks. Henry Boot Construction - School extension on the Fylde Coast, Lancashire. British Rail - Temporary warehouse for the maintenance of railway locomotives. Hilton Process Solutions - Scaffold around an industrial bakery during construction. Leach Structural Steel - Edge protection provision during the construction of factories, warehousing, farm buildings, etc.. throughout the North West area. Jones Contracts / Orbit Office Suites - New development of 5 large brick-built 3 storey office blocks at Middlebrook, Bolton. Extension of existing brick-built office blocks at Parkway, Manchester. Volker Fitzpatrick - Scaffolding during construction of contempory new tram sheds at Starr Gate in Blackpool. Wain Homes - Scaffolding and safety decking for the development of 90 new builds in Stalmine, Over Wyre. We have a highly Trained and Accredited Workforce and offer a safe, quality scaffolding service at a competitive price. 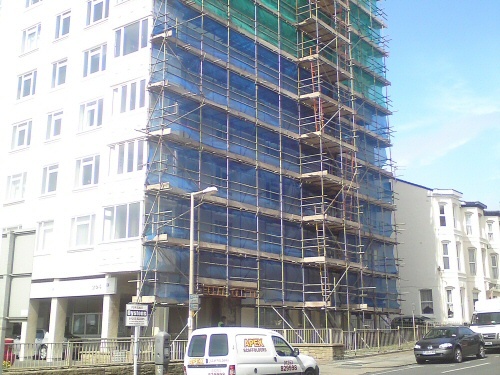 Whether you're looking for scaffolding contractors for a large or small scale project, give Apex Scaffolding a call.